A set of seven assorted vinyl covers with an elasticated opening. 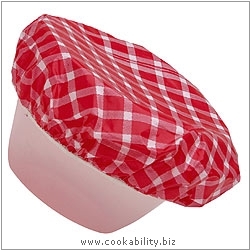 Ideal for covering food in the fridge, at parties or barbecues. The sizes range from jam jar size to the largest which will stretch over a 10" bowl. Bowl show is not included.